ImageTek Labels, a registered reseller of Zebra, Intermek and Sato Print Technologies and is well versed in offering you quality, durable printing solutions to help identify and manage your assets more effectively. Improve business performance and productivity with on demand thermal transfer printing solutions. From compact desktop compact printers to Industrial printer laminating machines there is no application we can’t handle. ImageTek Labels provides the integrated software tools you need to customize your labels, increase printer capabilities and enhance performance. These programs allow you to create your own Barcode, 2D and QR coded labels to bring asset management in house and immediate. ImageTek Labels supplies a variety of barcode and RFID printers and can offer a viable solution for your project demands. We have Real-time solutions that control assets and transactions, providing a great value and quality product. Contact our Sales Team Today for more information on the benefits of on demand , total solution printing. The Protector 5 creates durable labels that withstand harsh industrial environments. Simply place a roll of label material and a roll of laminate into the into the Protector and printer . After printing, the Protector 5 will apply the laminate over the labels, then cut the labels precisely though. ImageTek’s laminations protect the labels from heat, solvents, corrosion, moisture, abrasion, oils chemicals and UV exposure. Literally hundreds of material combinations are available. Applications include: outdoor use, engine parts, under-water as well as protection through painting, staining or enameling. The Protector % is a unique and intelligent cutter. It is able to cut through the laminate and material without cutting through the liner. The MP 850 is an in-line or off-line stand alone label finishing system, that can laminate and rotary die cut pre preprinted labels produced by any roll to roll label printer. The MP 850 reduces inventory and inventory cost. There is no need to inventory die cut blanks or preprinted labels. You can print and die cut what you want, when you want. The MP 850 prints and die cuts labels up to 8.25” x 9” at speeds up to 8 IPS (inches per second). It uses an all electronic set up with an interactive touch screen display – no tools required. Simply create your label and add a small registration mark, then feed the stock into the MP850 from the printer or the pre-printed label unwind spool. Our Smart Eye will determine the repeat length of the marks and automatically set the cut distance. You can depend on the MP 850 to cut your labels with precision. The cutter will compensate for most variations in the print to print registration. 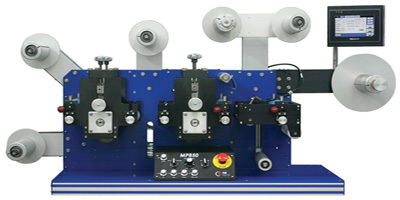 The MP 850 rotary cutting technology cuts through the laminate and label material without cutting into the label liner. ImageTek uses Thermal transfer printing solutions because our years of experience have tought us it’s the most durable solution. The printer, ribbon and substrate work together as a printing system, combinations are endless and also, the most important in the success of your project. Thermal transfer printing works in that the ribbon’s ink is melted onto the substrate.Thermal transfer printing is reliable and low maintenance, and can be applied in a wide range of on-demand printing applications. ImageTek supplies ribbons for barcode, flexible packaging, security, high temperatures and chemical resistant applications. In a variety of Wax, Wax/Resin, Premium Resins and Specialty High Temp or Solvent resistant ribbons, we can find you a ribbon that survive the most harsh of environments. Color can play a very important role in your label projects success. Use to identify tracking, coding and stock as well as maintain branding, exact color match is a must. ImageTek offers a full color wheel of options with various levels of durability.